This was the moment an air ambulance landed at Barnsley FC’s Oakwell Stadium after a man fell seriously ill before the match against Burton Albion was due to begin. This afternoon's clash was postponed following the emergency and people have been sending the man their best wishes. Richard Woodward, who shared this video of the air ambulance at the stadium, was among many fans sending the man their best wishes online. The man was airlifted to hospital. His condition is not known at this stage. 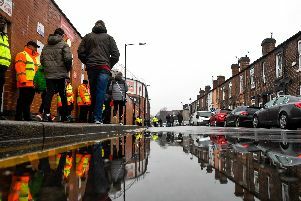 Barnsley FC has sent the man the club’s best wishes and praised emergency services and fans for their response.